I love the Northwest. I really do. If my life lasted another 80 years I’d plan on being based here for at least 70 of them. That being said, sometimes Southern California just feels really, really nice. This recent visit was my first time in Los Angeles. Growing up in my house LA was always the bad guy. The big polluted city full of nothing but rich jerks, airheads, and gangs, all either pushing or using drugs that they wash down with water stolen from the poorer outlying towns. And they don’t have seasons! That’s the way I was raised. Blame my father. After that you terrible description you might be wondering why I would ever visit LA. Well, I work in the student programs of the Associated Students of Puget Sound. I work in the office that brings performers to campus. Lectures, comedians, movies, musicians – stuff like that. There are 7 of us in the office and this year three of us got to attend a conference called NACA West. NACA stands for National Association of Campus Activities and is kind of like a showroom for college performers. Agencies submit members of their roster to be showcased for the students and advisors that make the decisions and we in turn choose whether or not to book these performers for dates on our campus. It is a great opportunity for the school to tap a new source of talent as well as a wonderful experience for those who get to attend. We are lucky that Puget Sound sends students every year and I am lucky that I have been able to attend twice. Now, to be fair, NACA West was not in Los Angeles. It was about an hour East in Ontario, California. Where is Ontario? Well, its East. That’s all I can tell you. They have an airport. And three In-N-Out. And a mall. And two movie theatres sharing a parking lot for a total of 52 screens. And hotels built for the sole purpose of servicing the people who visit that mall. And of course a convention center where we held our conference. Luckily (I guess) the cheapest option for travel was to leave Tacoma at 3 AM on Thursday and arrive early in the morning in Los Angeles. Registration didn’t start until that afternoon and we didn’t see any reason to explore the Ontario mall, so we did what any other vitamin C deprived Washingtonian would do in the middle November, we went to Venice Beach. Despite never getting used to the fact that the shapes I saw on the horizon were not mountains but smog (gross), those two hours on Venice Beach almost made up for a childhood of brainwashing I endured about California. Yes, I saw a lot of those problems but they didn’t seem to bother me. Maybe it was sudden rush of sunshine, or maybe the smog was cutting off my oxygen supply, but I actually enjoyed my time there. And then we made it to the conference and I saw Zero from Holes ruin my childhood by enlightening me about his new rap career. Maybe that knowledge would have been palatable on the beach, but not in a dark conference room turned theatre. Despite Mr. Zeroni’s efforts, I still flew North with a better appreciation for Southern California, and you know what, maybe this is the lack of sun talking, but I’m not sure I’d object to joining the So-Cal alumni and spending more than a weekend down there. Although there have been many times that I had downtime, just browsing the internet, I haven’t had a real break from college or doing work since my mom came to visit a couple of weeks ago. The time passes by quickly, but at the same time moves viscously; it’s Monday and suddenly it’s the weekend but you have a paper due on Tuesday plus as exam. This cycle is constantly repeating itself and I can’t wait to finally see the end. Yet there is still a solid two weeks left of the semester to keep learning, growing and working hard for finals before I can take a serious break and go back to Hawaii. And going home is the driving motivation for me, and many students, to get through these last few weeks of my first semester of college. I’m so grateful I could visit family in San Francisco over this short Thanksgiving Break because it’s definitely made me less homesick and tired for the semester to end already. Now is the time for me to finish strong, keep going until the very end. And I know now that there are many opportunities on campus to take little breaks such as going to the student market, an acapella concert, visiting Zoo Lights or just going outside to appreciate our beautiful campus. There will never be anything as comforting as lounging on my couch in front of my TV at home, but I can still take a break from the busy college life. On a different note however, visiting my family has made me realize what things I miss about home. I miss showering without slippers and taking my time in the bathroom, singing in the shower with no one listening. I miss those lazy Saturdays, falling asleep on my couch in front of the TV. I miss going to my brother’s baseball games and feasting on the delicious potluck, and talking to all the aunties and uncles. I miss TV, watching Say Yes To The Dress, Full House, Friends and all kinds of reruns on the big screen and not just computer. But most of all I miss the company of my family. And I want to make them proud and this separation and investment in my future worthwhile by finishing this semester strongly. And if I need to take a break I will, but I know that I’ll come back stronger and more focused than before. We left the SUB on a cold, clear Saturday morning, and I sat like a zombie through the car ride, munching on my container of kefir and Uncle Sam cereal. This was to be my first Habitat for Humanity “build,” although technically there was no building involved, just a lot of hauling, dumping, shoveling, raking, wiping, painting, and washing. Since the build site is not just a house but a whole development (a “gated community without the gate,” as one future resident told me) there was ample work to be done for every stage of the process. Many of the tasks called to my mind and muscle memory the work that I did this last summer, picking up odd jobs all around the Tacoma area. It was fun to get back into the rhythm of manual labor, to be in a place for several hours with the sole intent of putting as much of my sweaty efforts into that development as I could. Well, I guess not the sole intent. Along with a sense of well-being, the other volunteers and I got paid in baked goods and good company. The homeowners who were working with us were very friendly and appreciative of our work, and the ones I met seemed happy with the process as a whole, even though it involves a big investment of time and work. There is time spent waiting to get approved, the time it takes to build a house, and 500 hours of work they are required to put in. Even though the housing is designed to be affordable, it is still out of reach for many. Nonetheless, it feels to me like a substitute for the old-fashioned helping one’s neighbor raise a barn. I’m told the world’s getting smaller, so it seems reasonable to help some neighbors who live a couple towns away. 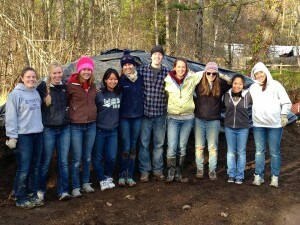 Here’s a picture of some volunteers from the University of Puget Sound chapter, in front of our pet dirt pile that we were shoveling out to make nice, even lawns. There will also be a big park in the middle of all the houses – I like all the green space! Anyway, that’s one way to spend a Saturday morning and afternoon that will get you outside the college bubble, while still hanging out with some college friends. Fun fact: the TCI Department for the Environment and Marine Affairs has twelve officers nationwide. There’s nothing like the feeling of being done with exams – which I now have been for several delightful days. So here I am on my tropical island, no more classes, and two weeks until I go home to DC; clearly, all I’m doing with my life right now is tanning and swimming in the clear, warm, turquoise ocean, right? Actually, right now I’m sitting in my room wearing a fleece jacket and looking through the window to grey, Tacoma-esque skies. I just got back from a snorkel at a site called the South End of Long Cay, and for some reason the elements never cooperate when we go there. Last time, there was a huge current; today, it bucketed rain. But hey, an eagle ray swam right next to us, so there’s that. Lectures are over, but we’re still collecting data for our directed research (DR) projects (thus the necessity of the stormy snorkel). Our papers are due a week from tomorrow, which is an absolutely terrifying thought, and then we spend a few days presenting our research to the community and the rest of the Center. And then we return to the world of normal winter (as opposed to winter here, which means sleeping under a sheet and without a fan on). But before that, we have to get these papers written. It’s already looming over my head, and we haven’t even finished collecting data – and then there’s the analysis of said data. 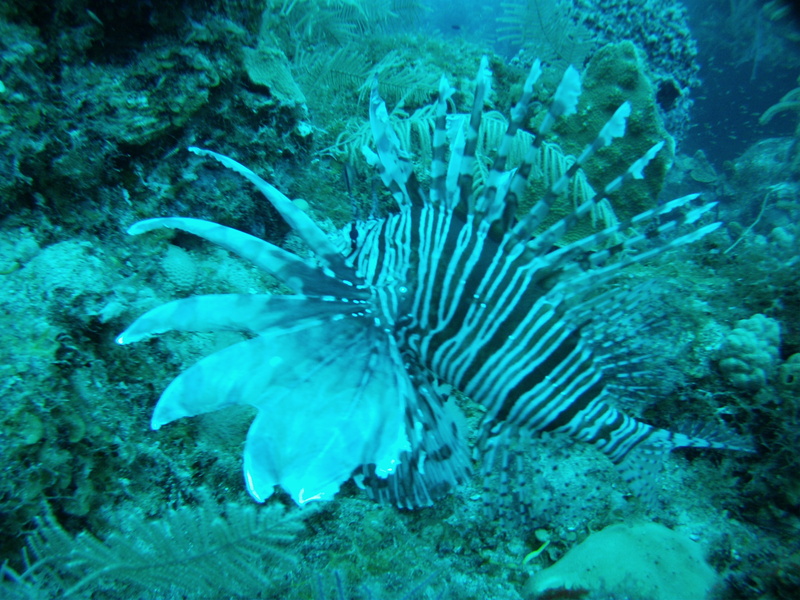 I’ll be creating a management plan based off of my group’s findings regarding the abundance of the invasive lionfish Pterois volitans, which basically means that I’m acting as a middleman between the scientists and the policy-makers, synthesizing and interpreting our results to suggest methods for controlling the lionfish invasion. Think about it as a report for a government environmental agency, giving them scientific knowledge in a way that gives them a basis for creating policy – because may be what it turns out to be. Fun things can happen when you’re at a prestigious field station in a small island nation. It doesn’t have a name, or a gender. If you’re around campus you may know it as the blue Centurion LeMans waiting for me outside Thompson, missing some of the foam padding that came with the seat, the handlebars mostly bare metal at this point, the derailleur bent out of shape from being dropped too many times, with broken baskets for my feet and, if you look closely, two spokes on the rear wheel popped loose. I’m working on getting these things fixed. It was only recently, when I started racing cyclocross, that I got into the habit of standing up when pedaling up a hill. Or at any time. My new trick is standing up without holding on to the handlebars, which only works on a downhill or briefly on a flat. When I woke up this morning it was dark, I mean inky middle-of-the-night dark, which I am getting used to on my early Friday mornings. It has been so cold these last few days that I was tempted for a moment to drive the five blocks to the SUB, before realizing that my boyfriend’s car was covered in frost and it seemed like too much trouble to scrape. Instead, I got my bike from the garage. As I was wheeling it out, I noticed something strange. Stars. Bright stars, shining in close proximity to a half moon. The frigid clear air made their light so piercing that I woke up out of my zombie state to say good morning to them. And I pedaled to work, holding my back light behind me and looking over my shoulder at the moon, and I was the only person on the street, the only person in the world to observe the hidden treasure of an early morning skyscape. By the time I reached my destination, the hand on my handlebar felt frozen on, a claw that I could hardly unclasp from the icy metal. I bike around campus a lot, end when I round the corners my foot baskets tend to graze the ground, because they’ve devolved from baskethood to pieces of metal that are tied to what should be the pedals on my bike. They’re good for alerting pedestrians, who dart glances at me to find the source of that ungodly noise. I went in to get my wheels tightened and trued at the bike shop on campus, only to find that Friday afternoons are apparently a rush time for them. I curled up on a couch with a friend who happened to be there and watched Daniel fix someone else’s bicycle for about an hour, before telling me that he would stay late to fix mine. I tried to protest but he insisted, lifting it with care to the operating table, by which I mean the clamp that holds the bike in the air (I’m really bad with these terms). I told him about the bike’s significance, how it’s my first road bike, salvaged from a garage sale, used to commute to work and school from high school onwards. How it took me from Seattle to Portland with my four siblings and brother-in-law during the 2011 STP. How it doesn’t have a name, but its value to me is far higher than whatever someone would pay for it, and so I’m going to go on fixing it and keeping it alive as long as I possibly can. He nodded, understanding, and made it rideable once again. When I came home this afternoon, after hours of work and class and homework and play, the sky was a hazy shade of winter. Not as striking as the stars in the morning, not a spectacular vision of colors, it was just enough of a sunset to ride off into on a broken-down bike like mine. Everyone told me college wouldn’t be easier, it’s only four more years (well three and a half now) before I’m thrust into the real world to live my life. Yet registering for next semester was way more complicated than I thought it would be. The requirements in college are different from high school, but I actually enjoyed this opportunity for me to see the various classes all the disciplines offered. My advisor gave me some pretty good advice, “Take something that interests you.” So many times the news reports the current industry booming and parents drive their parents towards pursuing a career in those successful industries, but I think it’s up to every student to figure out what they truly love to do and how they can turn that passion into a life. I could take something I never considered before, to see where my other interests may lie. I browsed the system and quickly found a multitude of classes I was interested in and began looking at how they would fit into my schedule and back-up schedule since there was absolutely no guarantee I would be lucky enough to get every class I wanted. Registering was organized by those with the most credits getting to register first with freshmen registering last. It was saddening to hear others rave about the classes they wanted and see them just as quickly become closed, as my advising group registered in the late afternoon on the second to last day. My registering period opened during my biology lab, and I remember furiously refreshing my account throughout to lab and see the status of all the classes I wanted, the first schedule, back-up schedule, and back-up to the back-up schedule become filled. Luckily my lab finished a couple minutes before registering and I clicked furiously to try and claim the last spot in that open class or quickly get on the waitlist. Two of the classes I wanted were already so far down their waitlist that when I emailed the professors later that afternoon inquiring about my possibilities they thanked me for my interest but suggested I try again next semester. Talking over my choices and options with my mom helped me figure out what I would enjoy the most and help me figure out what my interests truly are. Registration was an unbelievable stressful and crazy experience. These classes I’m taking are meant to fill me with the skills and knowledge that I will use in the future. And that thought right there is crazy for me; that my future is here and I need to do everything I can to make my dreams and passions a reality. But I need to figure out what those dreams and passions are and I strongly think that my spring course load will help me truly figure out who I am as a person and how I want to change the world. The future is definitely closer than it seems, especially closer than how it felt six months ago at graduation. In which the unbreakable circle of Rat Skin Thong is revealed to the world. The phrase “Rat Skin Thong” is one that, most unfortunately, I cannot claim credit for; it was bequeathed unto me, like a sacred name of unspeakable power, by the aunt of a very close friend of mine during a barbeque her family was hosting. The close friend of mine, whose name is Fiona Flynn, debated with me about changing the name of the band that she and I comprised from “Dwolf and the Fat Angry Chicks/Fdog and the Funky Crew” (depending on who was singing lead) to simply “Rat Skin Thong”, although ultimately deciding against it. Never did I think the name would arise again. Many things bind us together, among them food… jk lolz, that’s it. Well, not exactly. Rosa, Isabelle and Alexa are bound by a deep interest in science, medicine and the disgusting, fascinating things that can be found on the interwebs concerning malicious maladies. Alexa and Shoshana share a love of religion and its social implications, while Alexa, Kaylene and I are fellow warriors in the never ending battle against the dark forces of Geoffery Block’s Music 230 class (Music History: Antiquity Through Baroque), as well as the glory of songwriting and arranging. Collectively, we are bound by Katy Perry dance parties as study breaks at midnight, endless supplies of cheddar cheese, our fear of Pennywise the Dancing Clown (who is a monster that probably lives in the decrepit, foul-smelling basement of our house), and our love of Starbucks. We have made lumpy, delicious cookies, caused a baby to cry out of fear of being eaten, and found marvelous ways of procrastinating together. But mostly, it’s just food. Moral of the story: So, whether you’re looking for a good time, excessive stress from Organic Chemistry, cookies from my mother, or general panic about life, look no farther than 1210 North Alder. Rat Skin Thong fo’ LIFE, yo. I may not have been blogging much, but I have been writing a lot: I’m working on three different research papers right now (god help me), as well as taking part in National Novel Writing Month. NaNoWriMo is something I’ve done every year since I was in high school, and every year around this time I start to question my sanity. Why on earth did I think this is a good idea? I don’t have time to write 50,000 words of a novel in a month, who am I kidding? But, on the other hand, I did meet some of my best friends at this school through NaNoWriMo in my freshman year, so this November writing madness at Puget Sound sort of has a special place in my heart. It’s weird to think about, because I’ve always loved creative writing, but before coming to this school–well, really, before this past year–I had sort of a phobia of showing anybody anything I’d written. This semester, though, I finally managed to get over a lot of that fear, and I know that a lot of that is due to the intro to poetry writing class I took last spring. I had been so reluctant to take a creative writing class, because I knew that I would have to share my work with my peers, and that terrified me. It wasn’t until my advisor really drilled it into my head, You NEED to take this course to fulfill your major, that I finally bit the bullet and just took the class, and I am so glad I did. That class forced me to get my feet wet, share my work with people, write about surprisingly personal things… and then helped me to realize that my peers have a lot of positive feedback as well as really helpful constructive criticism to give. My classmates and I were all in the same boat, all sharing our work with each other, and that definitely made the whole experience very supportive and welcoming rather than, you know… terrifying. So anyway, it’s probably because of that class that I’m a lot more comfortable with my writing nowadays. In my previous years here, I’d always wanted to take part in Crosscurrents Review, or submit my own poetry or prose, but I was always too nervous when the deadline rolled around. This semester I managed to submit poetry to both Crosscurrents and Wetlands, and had a lot of fun being part of the poetry team on Crosscurrents Review. ‘Til next time… peace be in the galaxy, fools! Major Decisions: Can The Sciences and Humanities Go Together? As a computer science/English double major, even I didn’t think I’d find a way to unify such an odd couple. In fact, I never expected to study these subjects before I came to Puget Sound. It was Puget Sound and its combination of professors, liberal arts courses, extracurricular opportunities, and classes in subjects that sounded compelling but that I never imagined studying until college that somehow edged me toward the two disparate disciplines. And it’s largely Puget Sound that’s ultimately done the work of bringing together this odd couple for me. I’m also in the process of developing a web app for Pearson’s first ever Student Coding Contest. The academic publisher sought out proposals for apps that integrate with their online learning module, and I was fortunate enough to have mine accepted. I won’t spill the details yet, but the app is designed to help bring the writing process online. The app’s due at the end of the month, and the ever-too-brief hours of furiously coding have commenced. So, I must admit that I was skeptical at first about finding ways to pursue both of my interests in computer science and English. Puget Sound is fairly unique, I think, in encouraging students to pursue such unusual combinations. International Political Economy; Science, Technology, and Society are interdisciplinary mainstays, while a new interdisciplinary biophysics program is developing, and I know countless people pursuing and loving a huge variety of double majors. Puget Sound is also unique in offering highly focused programs so that students don’t ever have to sacrifice depth. 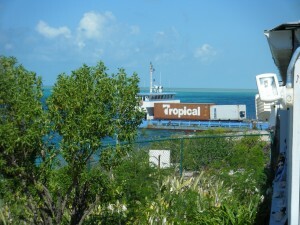 Fun fact: over 90% of the food consumed in the TCI is imported. Wednesday mornings have the best scenery of any day of the week. When I look out from the Center, I see a stretch of sparkling turquoise water, hopefully flat so it doesn’t limit our water activities for the day, the limestone-and-scraggly-vegetation hill of Long Cay, maybe a flamingo flying around or a local fishing boat getting some air off of wave crests on its way out for the day’s work – and a ship. Well, possibly multiple ships. But what makes this one particular ship exciting is that it carries all of our food for the next two weeks. The availability of food isn’t something that you really think about in the Unites States. I know there comes a point in every semester when all you want is a home-cooked meal, but still, the SUB exists so at least the food is there and you have the opportunity to eat it. This isn’t to say that we go hungry here on South Caicos at the CMRS – just that fresh food is less readily available than some places in the world (although certainly more readily available than others). Depending on a floating piece of metal with some boxes on it showing up every so often in your backyard is rather different than popping over to Safeway because you need your own personal jar of peanut butter. In 2008, Hurricane Ike slammed into the Turks and Caicos Islands, severely damaging or destroying a third of the buildings on South Caicos and temporarily preventing the food ship delivery. Now, five years later, a lot of the buildings still haven’t been fixed – at East Bay, a favorite beach bonfire site near the Center, the remnants of a hotel development are scattered around the sand and pine trees. On any given visit, if it weren’t for the number of pine needles on top of the piles of lumber and insulating materials, the hurricane could have happened last week and we could be out surveying the damage for the first time on empty stomachs. Basically, the ability to walk to the Met and take as many free cheese samples as your conscience will allow (not that I’m speaking from experience or anything) is a luxury. Which sounds a bit cliché. You don’t realize how different things are in other places until they are suddenly made relevant to you – like eating rice and cabbage for the fifth time in as many days while watching rusty shipping containers come trundling towards you over the algal plains and patch reefs of the Caicos Bank.